I have to make it a point to do a review just before or preferably just after a book club meeting. I find that if I wait a month, my thoughts lose their clarity and I revert back to a generalized statement about my feelings for the book. I wanted nothing more than to be fairly surprised and pleased with the novel “Pride and Prejudice” by Jane Austen. A couple of months back, I was pleasantly surprised by “Wuthering Heights” and I was hoping for something similar with this novel (of course, I assumed it wouldn’t be as dark). Unfortunately, the book for me was pretty much what I expected and took me back to another favourite literary quote of mine which was... “All is Vanity.” I think this pretty much sums up most of the Victorian Era, and this is probably one reason why I generally dislike works from this time. To synopsise, the main family in the novel are the Bennets who have five daughters whom their mother is trying to get someone to wed. Since they don’t have a substantial fortune/dowry, this task boils down to finding suitors that are either enamoured with the daughter’s beauty or in rare cases with their personality and disposition. The eldest daughter, Jane, is a sweet girl with good intentions. The main character, Elizabeth, is a strong and independent woman. Mary is a bookworm and has no interest in marrying and the other two girls (Kitty, Lydia) are dolts whose only interest in life seems to be marrying. Jane falls in love with Mr. Bingley and he her... and they both pretend that they don’t for a while before getting hitched. Elizabeth falls in love with someone that has a completely fabricated character until she is made aware of the lies. Then a simpleton offers to marry her seemingly just because. She finds a vile hatred for a man, Mr. Darcy, who she then finds irresistible and they eventually get married. There are few plot twists and as in most Victorian Era novels, most of the drama would be done without if the characters were just honest. Pride & Prejudice was Jane Austen’s first written novel and was only published (in 1813) after Sense and Sensibility was published in 1811. It was obvious to me that this was a first attempt at a novel... as there was very little consideration to what was going on in the time period (other than the concept of marriage and being an aristocrat), characters were not able to be related to (for the most part) and the prose was nothing to write home about. Of the lot of the characters, I found that other than Mr. Darcy, the only characters I enjoyed were Mr. Bennet and Mary... both minor characters that somehow spoke to me. Mr. Bennet is sometimes criticized for not really respecting his daughters equally, but it’s of my opinion that he just called them as he saw them. In a loveless marriage, I think he felt that the youngest two daughters were destined to be like their mother... something that saddened him. Mary was a bookworm and was likeable just because I could see myself trying to do what she did... staying out of the way of the drama. My notorious notepad went virtually untouched as I read through this novel – meaning that I could find virtually no quotations that I felt needed to be saved for future reference. The style was boring and not very effective in holding my attention. I wanted to read faster and faster not to see how it ended, but see that it DID end. Another thing I would like to add is that it seemed as though the author decided at the very beginning that the novel was going to be about “Pride” and “Prejudice” and she tried to fit everything neatly into these categories by hitting you over the head with it. You could have picked other adjectives which would have worked just as well such as ‘vanity’ and ‘dishonesty’ or anything else, pretty much. To me, the correlation between the facts and terms was loose. Most of the ladies in the book club liked the novel for personal reasons. Some had grown up with it as children and some had fond memories of watching miniseries’ or movies. There was one who liked the novel for its literary merits, but I cannot tell you exactly what she saw in it as I struggled to find something that I could say a good thing about. I wouldn’t mind giving Jane Austen another go, but as of now I’d prefer Emily Bronte... and maybe I’d give Charlotte a go. During our book club meeting on this book, I read a couple of quotes that I thought summed up my views on P&P quite nicely. One of them was by Mark Twain, and quite by accident I came across another one of his recently: "I haven't any right to criticise books, and I don't do it except when I hate them. 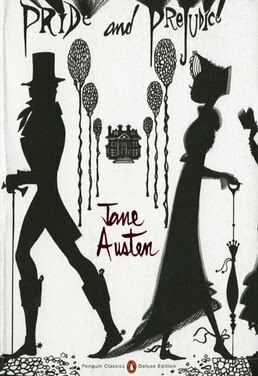 I often want to criticise Jane Austen, but her books madden me so that I can't conceal my frenzy from the reader; and therefore I have to stop every time I begin. Every time I read 'Pride and Prejudice' I want to dig her up and beat her over the skull with her own shin-bone." Not quite as subtle as the other one, but I have to admit it made me laugh. My apologies to those of you who are fans! Yes, I have to say I agree with you thus far on Austen, though I'm not ready to give up on her. She feels quite clausterphobic -- you're right about that, and I'd missed it. Where is the rest of the world in her work? I intended to write a comment, then noticed that this post had been written 4 years ago. What's your view on Jane Austen now? The same. I haven't read anything else by her after Pride and Prejudice - once bitten, twice shy.